Century of Action’s calendar of events highlights events across the state celebrating our suffrage centennial heritage. Are we missing something? Please email us at info@centuryofaction and let us know! 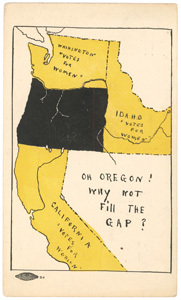 In late December 2012 one of our board members purchased this 1912 Oregon suffrage postcard for the Century of Action collection. 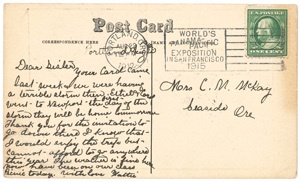 The image on the postcard front is unknown to any of us, and we would love to know who Hattie, the author of the message was, as well as her sister Mrs. C.M. McKay.